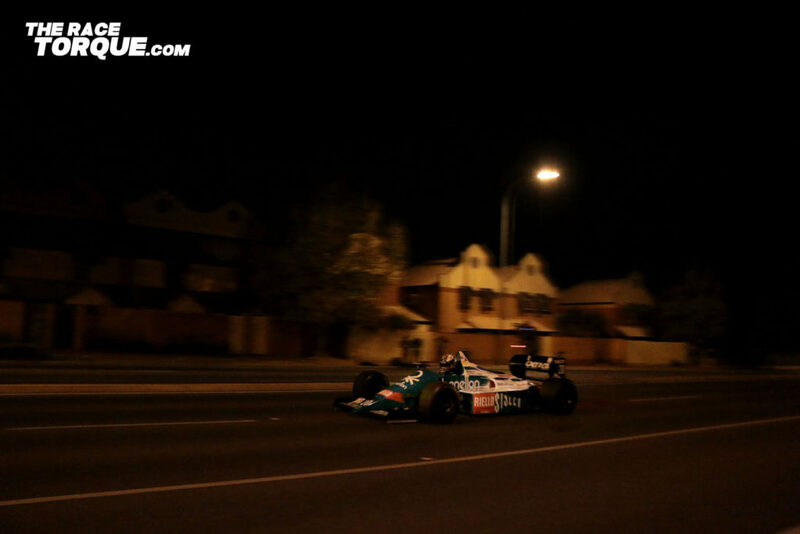 CLASSIC Formula One machinery, a genuine ex-HDT Torana A9X and even a fully-blown Ducatti Superbike took to the Adelaide city streets on Wednesday night, filming a short movie for the upcoming Adelaide Motorsport Festival (December 9-10). The undercover operation wasn’t promoted to the public, but still drew a significant crowd and enormous media interest from local media and the broader motorsport industry. The finished film will be more than just a commercial for the AMF – it will be a significant promotion for the state and it’s continued love of all things motor sport. 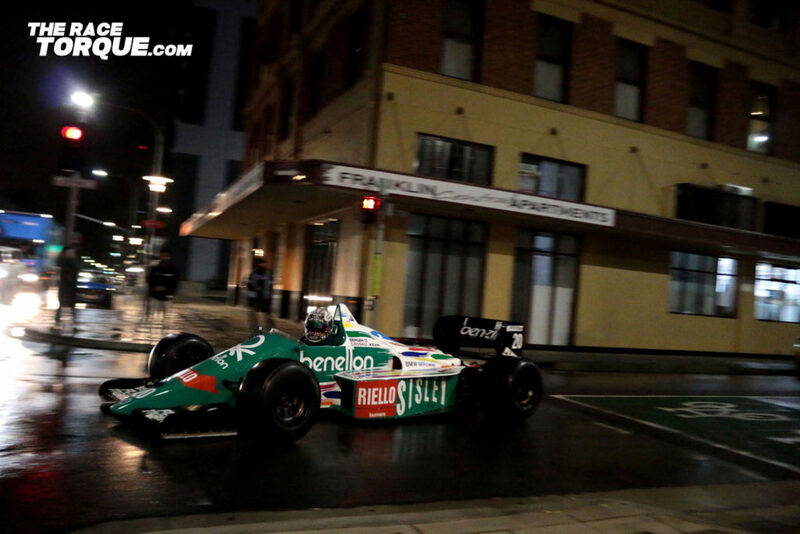 The enormous production included more than 100 people and included a fully CAMS-sanctioned permit, Department of Transport road closures and police escorts through the CBD, ultimately finishing in Victoria Park on the start line of the iconic Adelaide street circuit. 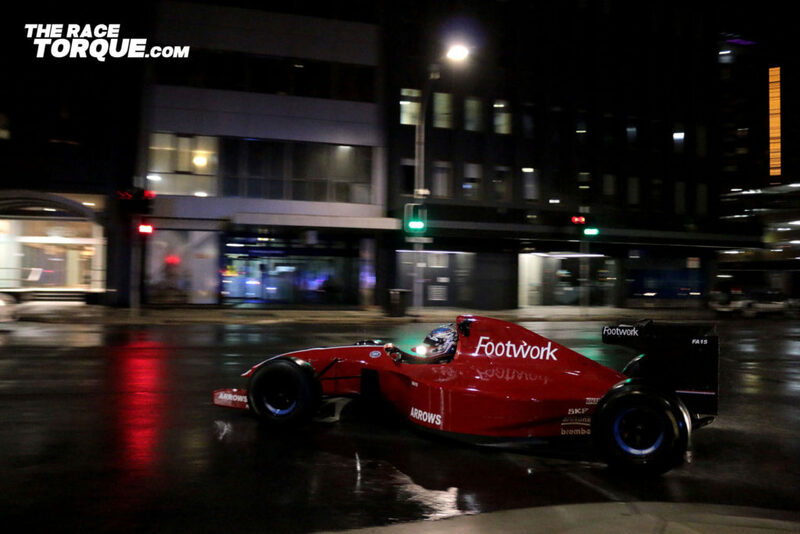 An enormous group of volunteers, ranging from Sporting Car Club SA members, Rally South Australia crews and even Adelaide University Formula SAe team members manned the route to manage crowds. 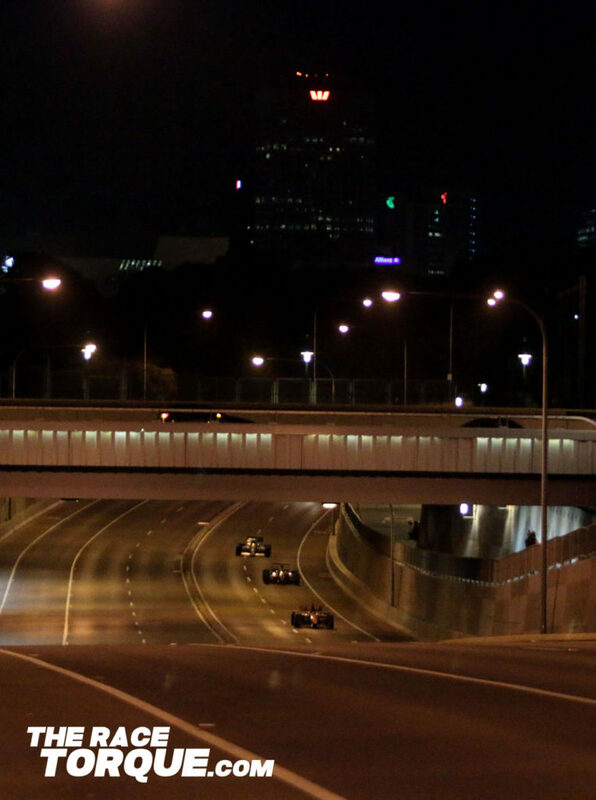 The remarkable scenes were added to when a brief downpour fell moments before the cars were scheduled to pass through the CBD. The Race Torque was on the scene, working with event organisers to document the evening ahead of the event this December. The film will be released soon and should be, based on early vision released, remarkable. 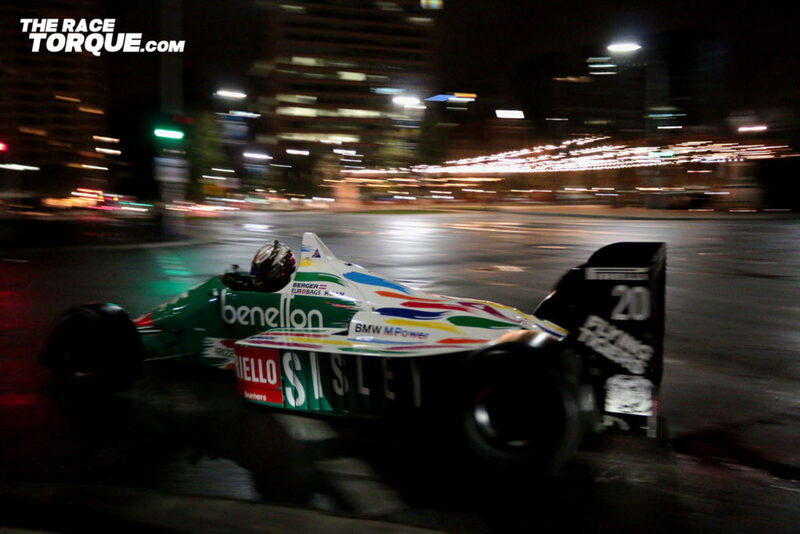 That’s Sandown 500 winner Cam Waters behind the wheel of the Benetton B186 BMW, that in the day produced about 1350hp in qualifying trim. On the night it was conservatively running ‘about 900’ horses. That a four-cylinder, turbo car can sound so mighty makes you wonder how they managed to get the current breed of V6 turbocharged cars so wrong. A ‘rolling roadblock’ organised by the excellent folk at the SA police stopped traffic as the cars passed, camera tracking car in tow and camera crews posted strategically throughout the route. 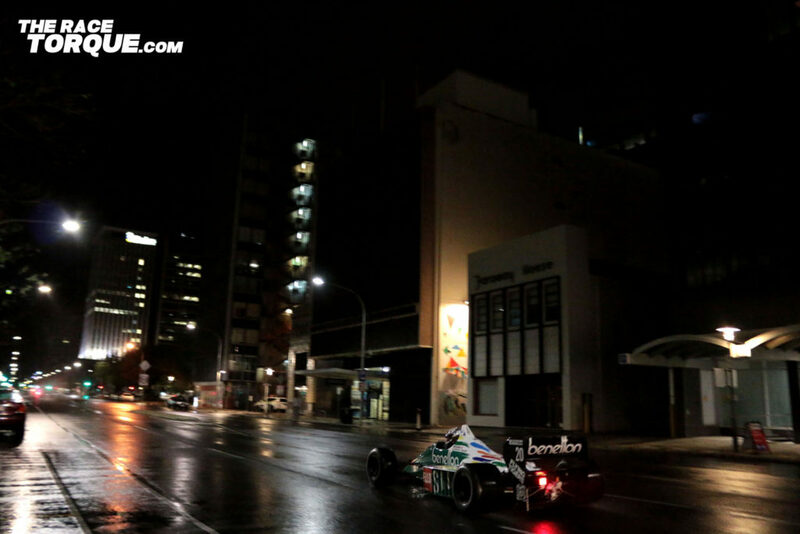 The Benetton passes up an Adelaide city street, headed to Victoria square. Note the slick tyres and wet road and imagine the traction issues that followed. 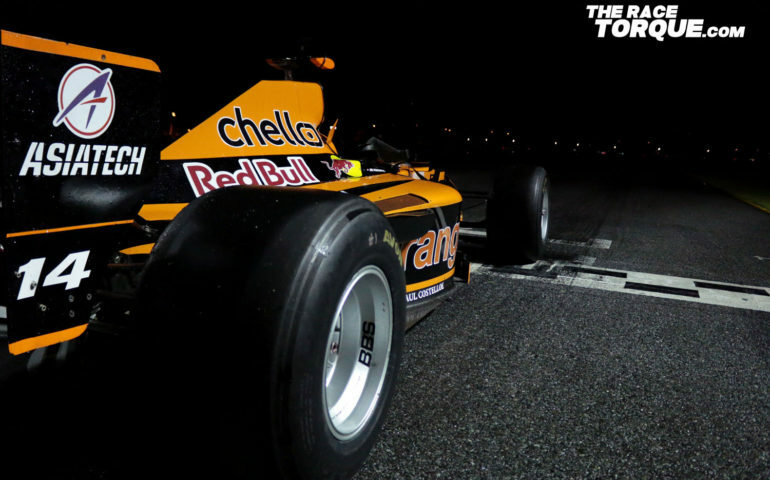 This writer has heard some cool things over the Motorsport journey, but a V10-powered Arrows struggling for traction on a wet road on slicks is one of the best. 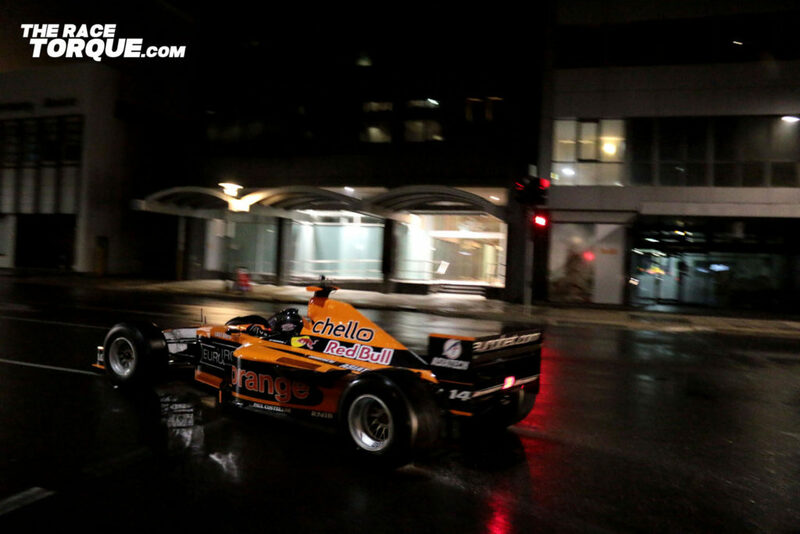 Here’s Josh Kean in the ex-Jos Verstappen Arrows that he modestly described as ‘challenging’ to drive on the night. This car was the full deal, including a more than hour-long process beforehand to pre-heat the fluids to temp prior to running. The car is a stunner and will be a star of the AMF this December and – ironically – could be the fastest F1 car to ‘compete’ at the event given in the past a majority have been Adelaide-era cars. This is Tim Slade behind the wheel of the 1994 Footwork FA15, raced in that season (And in Adelaide) by Christian Fittipaldi. A unique car, presented at the moment in a non-original livery but still very cool. Cosworth V8 powered, relatively simple and physically quite a substantial car for its time. The unique bi-plane rear wing is a standout. Cossie V8’s sound cool, by the way, and Slade seemed to be enjoying himself. I mean, seriously.. how many cities in the world would let this happen? This was perhaps the most fun of the night, because – trade plate and all – the A9x was a riot to watch and could ironically be a star of the film as it mixed it up with the F1 cars. We struggled to get shots of Troy Bayliss on the Ducatti for several reasons, the least of which is that he’s clearly just as quick as he always was. Keep an eye out for the video when it drops next week – it’s going to be immense. RACING RULES: TIME TO SIMPLIFY?